Studies show that people lose as much weight by eating more fiber alone as when they follow more complicated diets. If you’re looking to lose weight with one simple change, then try increasing your fiber intake. A great way to begin is to track your current daily fiber intake. Remember, the current minimum recommended daily intake of fiber is 25-30 grams. See where you are at and start increasing by 5 to 10 grams each week (and be sure to drink plenty of water to keep things moving in the bathroom!). If you find it challenging to meet the recommended amount there are fiber supplements (i.e. acacia fiber, inulin powder) that you can add in. Populations with some of the most diverse gut microbiota (which equals a healthier collection of the microorganisms that live within your gut) eat as much as 100 grams of fiber daily! So, what kind of fiber should you eat? 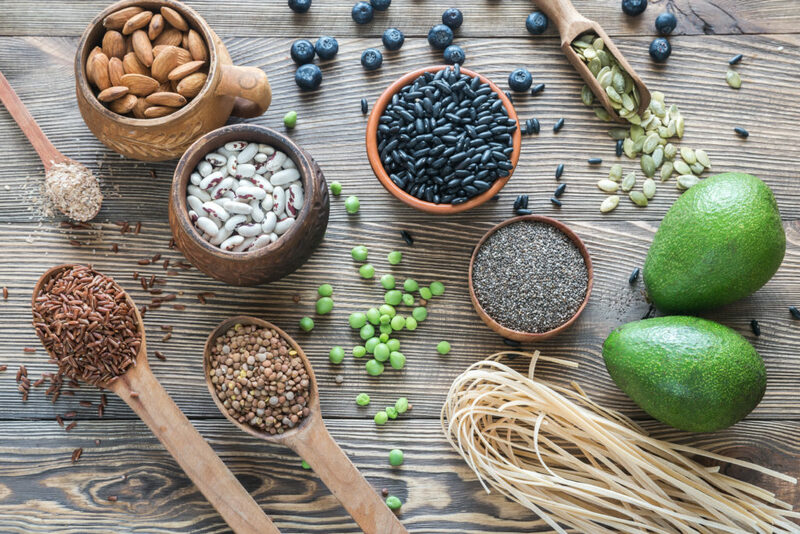 The best fiber comes from whole foods; include lots of veggies and fruits, as well as some nuts, seeds, and whole grains. SOLUBLE FIBER (i.e. citrus fruits, barley, legumes) binds with water to create a viscose gel in your stomach which can help you to feel full for a longer period. This is because it empties from your stomach at a slower rate than other foods. Soluble fiber also helps to slow the rate at which sugar is released into your bloodstream so that you maintain a steady energy level after eating. INSOLUBLE FIBER (i.e. wheat bran, veggies, and whole grains) does not dissolve in water and our bodies don’t digest it. It passes through your body intact and the calories in it do not get absorbed! If you’re trying to lose weight, this food adds bulk to your diet and fills your belly without adding calories to your waistline. Another bonus of increasing insoluble fiber is it can improve bowel regularity. If you’ve been thinking about trying to lose weight or are actively working toward a weight loss goal, please come meet with our team. We have a team of experts in weight management waiting to help you meet your goals! Please call 224.407.4400 or visit compgihealth.com to schedule an appointment.